Bluewater Cheer Athletics is co-owned by Jodie Bore and Sarah Faubert. 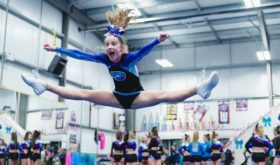 Opening a competitive cheerleading gym in Sarnia has been a longtime coming and is fulfilling our dream. We want to inspire our athletes to be healthy, active and fit while also sharing our love of cheerleading with others. We believe in coaching kids safely through skill progression and teaching proper technique. That is why all of our coaches are USASF certified. We hope to challenge our athletes to push themselves both on and off the floor. This sport teaches not only cheerleading but hard work, teamwork, dedication and responsibility. Cheerleading is unlike any other sport – every athlete plays a pivotal role on the team and trust is developed at the very first practice. Your teammates will become your siblings and your coaches will become your second parents. Most cheerleaders will tell you that once they start, they never want to stop. We want to help create lasting memories, build confidence, and encourage all our athletes to dream big – anything is possible if you believe!